If there’s one thing I love more than my very first slow cooker — which got me through grad school in North Carolina and our first few years of marriage in San Francisco — it’s my Instant Pot (affiliate link). If you don’t yet have an Instant Pot, you may want to put one on your holiday wish list. ASAP. That is unless you have a pressure cooker you’re not terrified of — in addition to a rice maker, slow cooker, yogurt maker and plenty of kitchen real estate to store them all! Can we talk about how scary pressure cookers are? They’ve probably come a long way in the past 30 years, but I still have visions of my parent’s pressure cooker spewing steam and violently shaking on the stove, looking like it was a bomb about to explode. Now a mom myself, I get the appeal of having a fully-cooked roast on the table in 20 minutes — I’m just not sure it’s something I’d risk my family’s safety over. 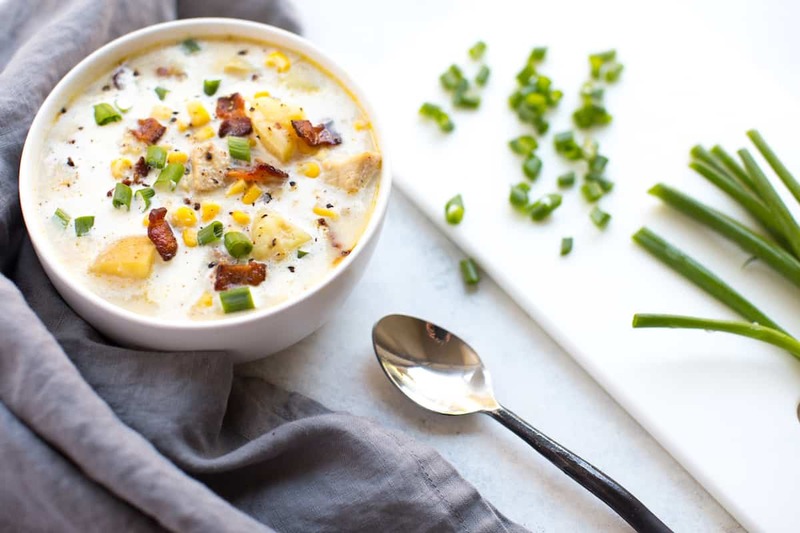 Insert the Instant Pot, the fool-proof kitchen appliance that makes pressure cooking no more terrifying than turning on a slow cooker and cooks things in a fraction of the time, like this incredible Chicken Corn Chowder made with milk. Before I dig into this big, beautiful bowl of chowdery goodness, let’s take a moment to talk about it, shall we? In addition to being one of the easiest meals ever in the history of man, it’s delicious and hearty. Made with wholesome, nutrient-rich milk, it’s thick and creamy yet not overly rich as chowders often can be. In my opinion, dairy milk is the way to go with this recipe, as alternatives would surely change the texture and overall flavor. 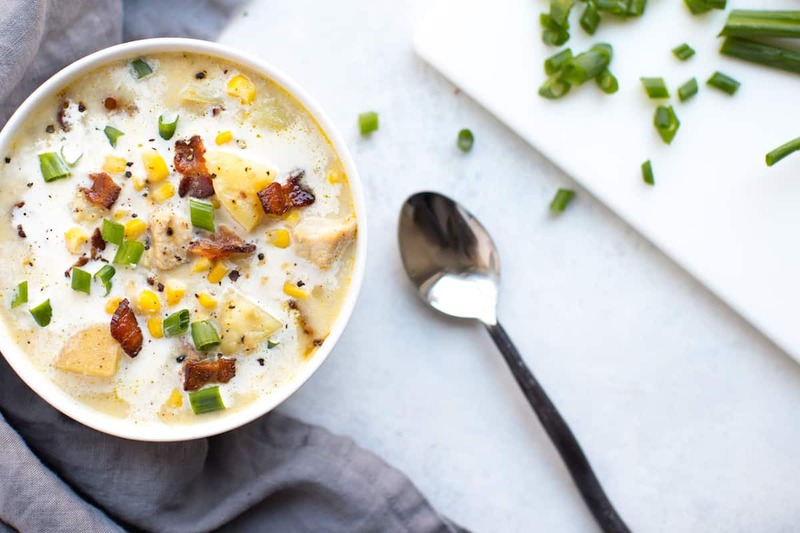 This chowder is also chock-full of sweet corn, buttery potatoes, and tender chicken. Oh and bacon. Let’s not forget the bacon. The whole shebang comes together in under 30 minutes, a glorious thing when your workweek gets crazy, and you’ve got a family to feed. Hence why the boys and I have been eating it on repeat this week! If you’re looking for a nourishing, delicious new meal to add to your weeknight rotation, pull out your Instant Pot and put this one on the list! Set Instant Pot to SAUTE on HIGH. Once hot, add chopped bacon and cook just until crispy. Using a slotted spoon, transfer cooked bacon to a paper towel-lined plate and pour off all but 1 tablespoon bacon fat. Add onion and garlic to the pot; saute for 2 minutes, stirring frequently. Add diced chicken and frozen corn; saute for an additional 3 minutes, stirring often. Turn off the Instant Pot. Add chicken broth, potatoes, salt, and pepper. Close and seal the Instant Pot, making sure the vent is in the “SEALED position. Set the Instant Pot to PRESSURE COOK on HIGH for 8 minutes. While the chowder cooks, make a cornstarch (or flour) slurry by whisking into the milk. Set aside. When done, turn the Instant Pot off and allow the pressure to release on its own, or carefully quick-release the pressure after a few minutes. Set the Instant Pot to SAUTE on LOW. Stir in the cornstarch-milk slurry, scraping any flour that settled at the bottom of the bowl. Cover and allow chowder to thicken for 10 minutes. Turn off the Instant Pot and portion soup into bowls. Generously top with bacon and garnish with green onion and a tablespoon of cream or half-and-half, if desired. Season with additional salt and pepper to taste. Heat a large skillet over medium-high heat. Add chopped bacon and cook just until crispy. Using a slotted spoon, transfer cooked bacon to a paper towel-lined plate and pour off all but 1 tablespoon bacon fat. Return skillet to the stove. Add onion and garlic and saute for 2 minutes, stirring frequently. Add diced chicken and frozen corn; saute for an additional 3 minutes, stirring often. Remove skillet from heat and transfer contents to the pressure cooker. Add chicken broth, potatoes, salt, and pepper. Close and seal your pressure cooker, making sure the vent is in the sealed position. Cook on HIGH for 8 minutes. When done, remove pressure cooker from heat. 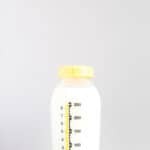 Allow the pressure to release on its own or carefully quick-release the pressure after a few minutes. Stir in the cornstarch-milk slurry, scraping any flour that settled at the bottom of the bowl. Over low heat, cover and allow the chowder to thicken for 10 minutes before serving. Portion soup into bowls and generously top with bacon. 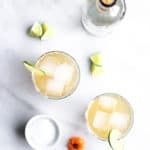 Garnish with green onion and a tablespoon of cream or half-and-half, if desired. Season with additional salt and pepper to taste. 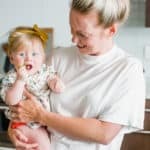 No Instant Pot or pressure cooker? No problem. Simply cut your potatoes a bit smaller and cook bacon according to package directions in a skillet on the stove. 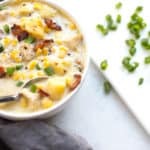 Add 1 tablespoon bacon fat to a large soup pot and sauté onion, garlic, diced chicken and frozen corn over medium-high heat as directed above. Add chicken broth, diced potatoes, salt and pepper and bring to a boil for 10-12 minutes, until chicken is cooked and potatoes tender. Add cornstarch-milk slurry as directed above, allow to thicken and enjoy! This is exactly like my wife’s shrimp corn chowder. Just replace the chicken with shrimp. Can the chicken be placed in raw? We made this soup and it turned out very nice! I used chicken thighs and cut them up and the recipe worked out just fine. 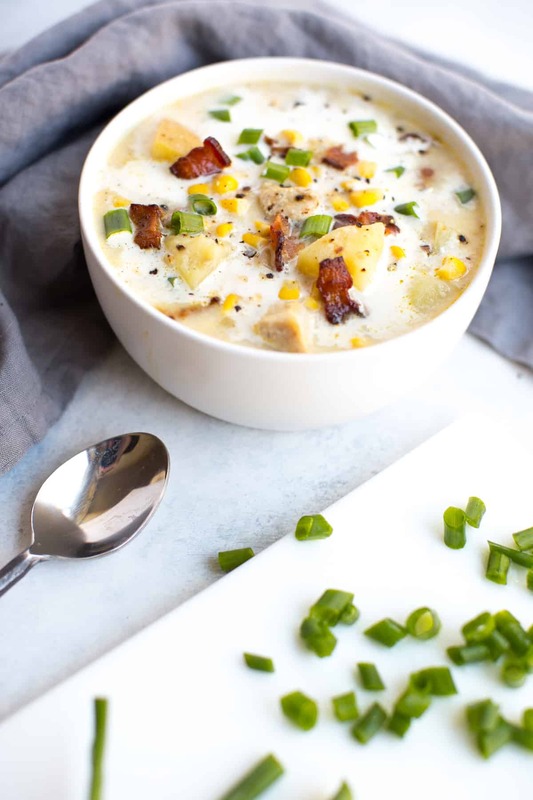 It’s the perfect soup for a cold winter weekend served with grilled cheese or a nice fresh salad. I cut the recipe in 1/2 since there are only two of us in my home now, but it worked out just great. I also used my food processor and used the thick slice blade on white potato and one large sweet potato. I cut both potatoes in half so that they would fit into my FP and change up on the potatoes worked out fine. I used my Instate Pot so that also helped with cooking the sweet potato. The soup was really good and not cheat yourself out of the onion or bacon on top. . Thanks for guiding me through the process. I modified the ingredients a bit, but followed your cooking times and directions and it went perfectly. Even the potatoes are cooked exactly as they should be! Absolutely a success. Much appreciation! Where did you buy this Instant pot?